So where does that leave a lovely little layer cake? Quite frankly, the answer is out in the cold (or, more accurately, in the heat - I turned on the oven maybe four times this summer). The last cake I made was for my husband's birthday, which was two months ago. And the one before that was for my son's birthday. If you had told me a few years ago that I'd go six months without making a meringue buttercream, I would've told you that such a thing would never happen. Well, it did. But special occasions, cool fall days, and most of all, an eager assistant, call for turning the oven on, pulling out the stepladder to dig out cake pans and piping tips, and then moving the stepladder over to the counter so said assistant can gleefully mix and sort a bowlful of cardamom pods while you make a cake. And getting back to old habits. So, happy birthday to me, and let's get back to cooking, baking, and eating together. Heat your oven to 350 F and place a rack in the middle. Grease and line with parchment three 6" cake pans and set aside. Put the pistachios in a mini chopper and pulse until very finely ground. Be careful not to turn it into a paste! Transfer the ground nuts into a small bowl and set aside 2 tablespoons for topping the cupcakes. Sift the flour, baking powder, salt, and cardamom into a medium bowl and set aside. Add the butter and sugar to the bowl of a stand mixer fitted with the paddle attachment and cream on medium speed until very light and fluffy, about five minutes. Scrape down the sides of the bowl, add one egg, and beat on medium speed until the mixture is uniformly smooth, about 30 seconds. Scrape down the sides of the bowl and repeat with the remaining egg. Add 1/3 of the flour mixture and mix on low speed until just combined. Add 1/2 cup of milk and the vanilla extract and mix on medium-low speed until the mixture is uniformly smooth, about 15 seconds. Repeat with the remaining flour and milk, scraping down the sides of the bowl after each addition. Add the ground pistachios (except for the reserved 2 tablespoons) and mix on low speed to combine. Divide the batter among the lined muffin pans. Bake until the tops spring back lightly when pressed and a toothpick comes out clean, about 30 minutes. Set the cakes on wire racks and cool them in the pans for 20 minutes, then flip them out onto a rack to cool completely. Bring 2 inches of water to a simmer in a saucepan that is wide enough for the bowl of your mixer to sit on top of it (but not so big that the bowl falls in). When the whites are cool, scrape down the sides of the bowl. Add 1/3 of the butter and mix on high speed until it is fully incorporated, about one minute. Add another 1/3 of the butter and mix for one more minute. Add the remaining butter and mix until the frosting becomes thick and uniform in consistency. This may take a while depending on how hot or humid it is, but don't lose faith - it will come together! After the frosting comes together, continue to mix on medium-high speed for another minute. Add the rosewater and mix on high speed for 10 seconds to combine. Use a long serrated knife to level the tops of the cakes. They shouldn't have domed too much, so you shouldn't have much to remove. Reserve one strawberry - the prettiest, reddest one of the bunch, preferably with a stem - and slice the remaining strawberries, setting aside the end pieces for another use (aka to let your toddler son eat to distract him while you frost the cake and he wants to stick his hands in it). Transfer the frosting to a piping bag fitted with a large star tip. Pipe a dollop onto a cardboard round and place one cake layer on it cut-side up. Spread two tablespoons of frosting on the cake, stopping one inch from the border. Pipe a ring of frosting around the edge of the cake. Fill in the middle with a layer of strawberry slices and top it with a ring of frosting 1/3 of the way into the center. Place another cake layer on top and press down very gently. For the top layer, pipe a spiral of frosting, starting at the outer edge and working into the center. 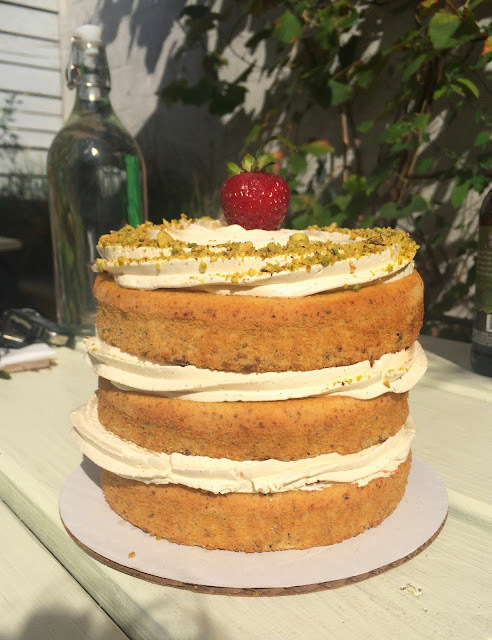 Sprinkle the reserved ground pistachios around the edge of the cake and place the reserves strawberry in the middle.